Get this bag as a custom team bag for $45 in orders of 25 or more and customize the printing on the end panels as well as adding your name and team or tour name to the side stripes. Turnaround time is 3-4 weeks from final art approval. Call us at 1-800-872-7842 to get more information. 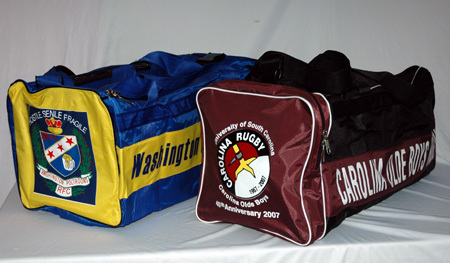 The Varsity Rugby Kit Bag (12”x12”x28”) is designed to hold your team kit, but is also great for personal use. The D-shaped zipper for the main compartment allows for easy access to items inside. An adjustable shoulder strap with heavy-duty strap attachments and carry handles provide easy portability. One large zippered end pocket is great to keep accessories like medical tape, Red Hot and ice packs separate. 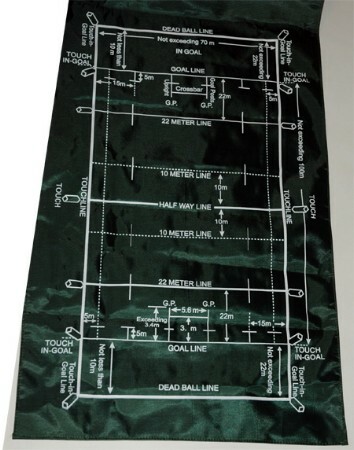 One side pocket contains our exclusive foldout tactics mat and field marking diagram but also leaves plenty of room for your mouth guard and personal items. This bag also features a supportive strap the runs on ends and along bottom for support and two rubber rectangular textured feet to protect the bottom of the bag when placing it on the ground. The coated nylon material is durable and easy to clean. This is also a great bag for your team jerseys and will fit a full set of 25.